Here are a couple of Valentine’s cards which I would be offering as my Valentine’s Class if my classroom were functional. But since I am “homeless” right now, I will offer card kits for this month. 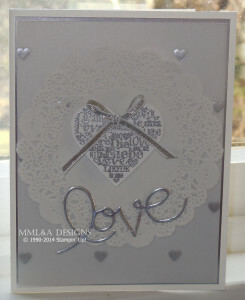 The first card is a silver and white card made with the new silver embossed vellum and layered onto silver foil. The stamp set is the Language of Love – however, if you don’t have this set – Heart’s a Flutter will work for these cards too. 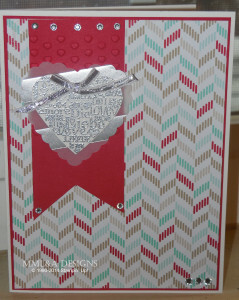 The second card is made with the Fresh Prints Designer paper stack and the Language of Love stamp set. 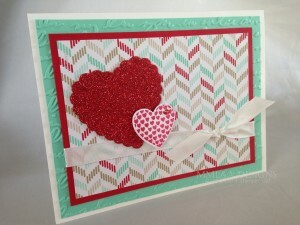 Again – the Hearts a Flutter stamp set would also work for this card. The third card is also made with the Fresh Prints designer paper. The hearts are cut from red glitter paper using the Hearts a Flutter framelits. The fourth card has a modern flair and is made with coastal cabana and real red card stocks and the silver embossed vellum. The stamp is from the Hearts a Flutter set. So the details: I will precut the card stock and provide all the embellishments – just like you are taking the class with me. 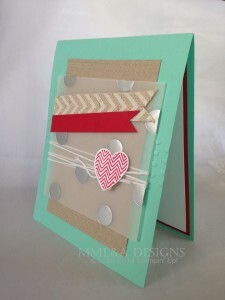 You can purchase this pre-cut card kit for $24.95 for 8 cards (2 of each of the 4 designs). Or – I am offering the full set of directions for these Valentine’s cards and more as follows: First 3 card directions for $11.95 Directions for 6 different cards for $19.95 (these 4 cards plus 2 other cards) Directions for 8 different cards for $24.95.